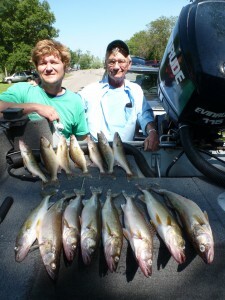 kori and Josh had some great fish! This entry was posted in Uncategorized on July 27, 2014 by Jim Kleist. 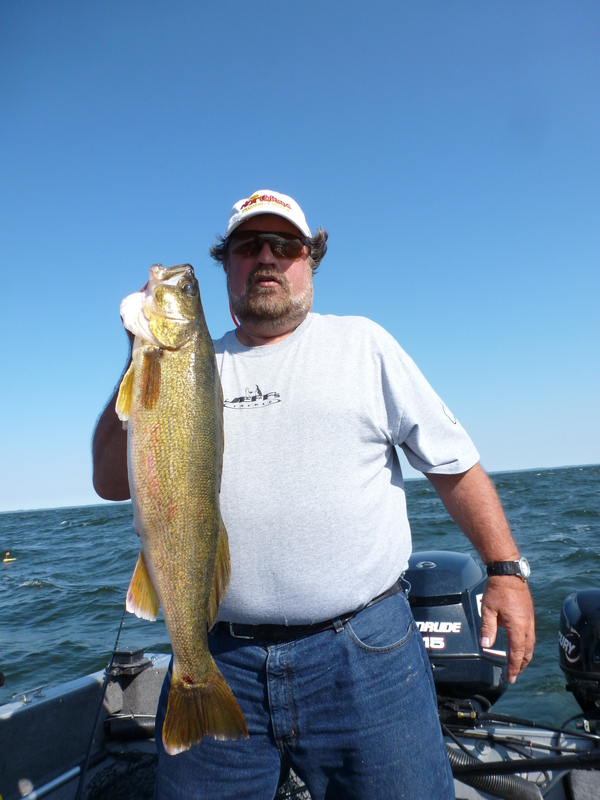 Fishing report for Monday and Tuesday. 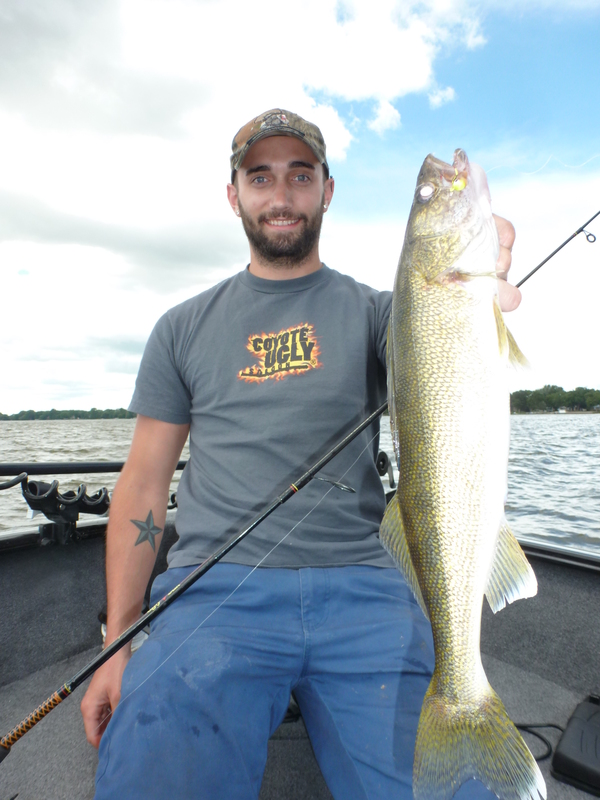 Monday night was Big Walleye night on the day the cold front hit! 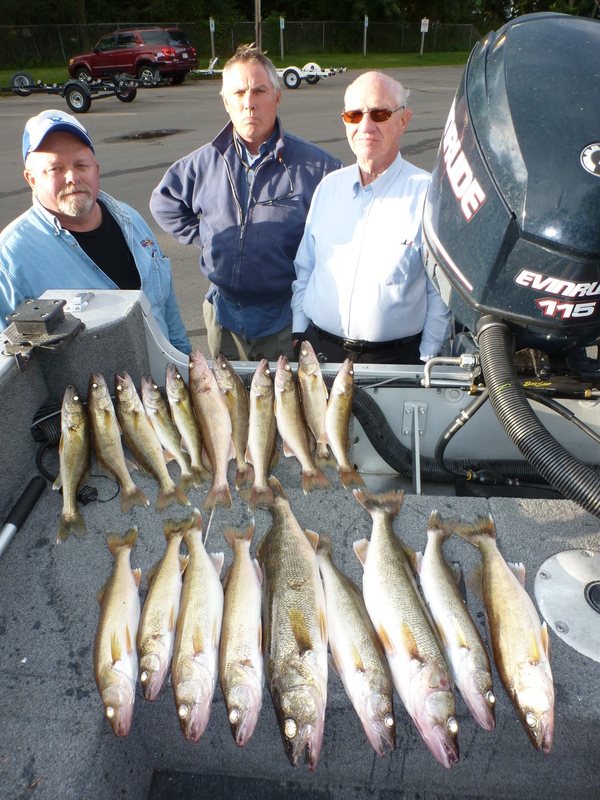 Several fish in the 20- 22 inch range if you know were to go. 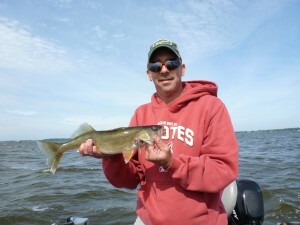 I had 3 guys that have never fished Lake Winnebago before and we caught over 20 fish. Casting jigs, baits like you do when you go to Canada. 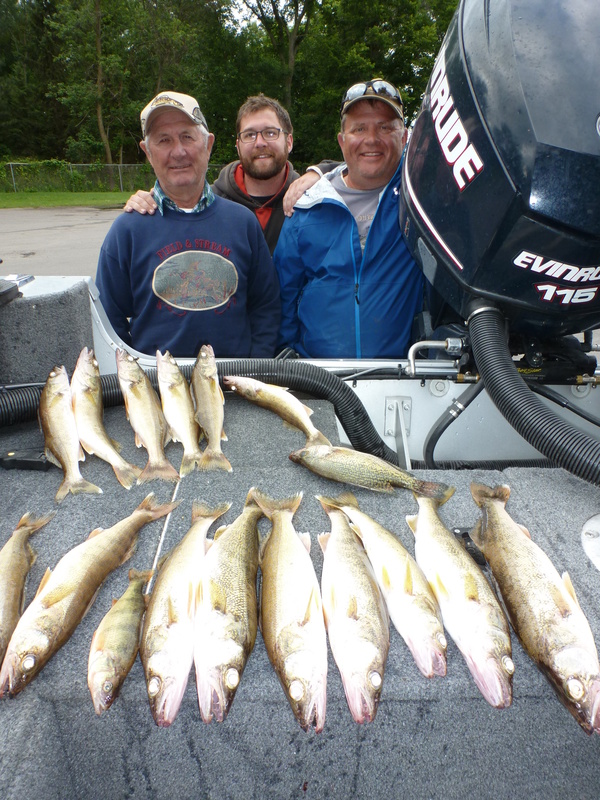 Gene, Mike and Ray proved they can catch fish with the right instruction and spots to fish. 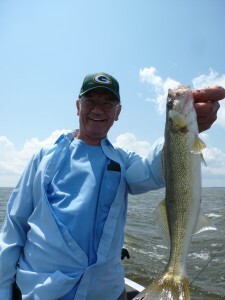 Today I fished with Mark, Drew and Gene who have a cottage on Lake Winnebago. They troll and have for years but wanted to learn how to catch fish with jigs and casting lures. 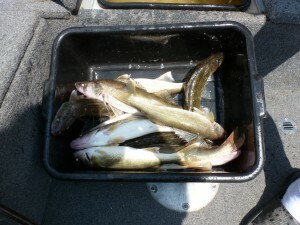 They caught 3 limits fishing with me jigging! This trio did awesome! 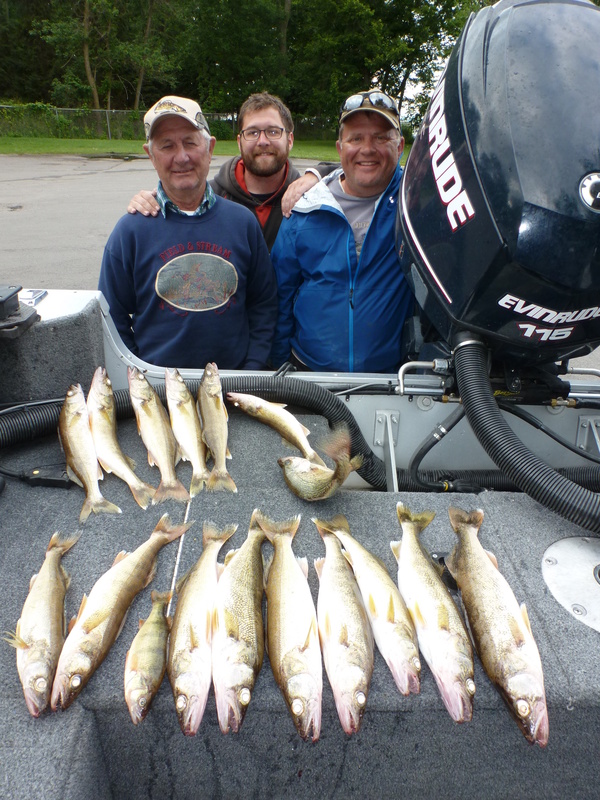 Today was tougher after the cold front passed but we caught 15 nice walleyes. 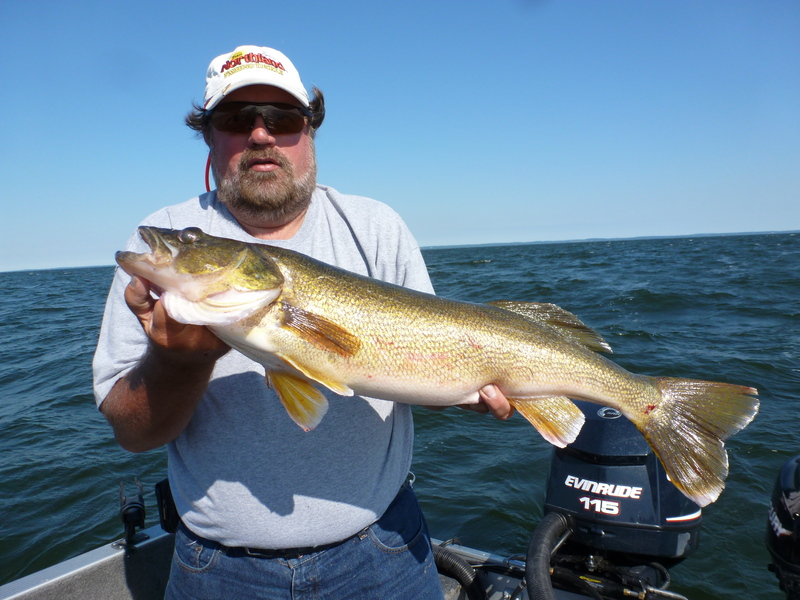 I love to troll also and If you desire to troll for half a day and jig the other half of the trip we will have fun and catch a lot of nice walleyes. Trolling we will catch twice as many fish as jigging and you will learn how to target walleyes trolling as well. It is a lot of fun when you have doubles and triples on walleyes trolling! You would swear the cold front shut everything down. 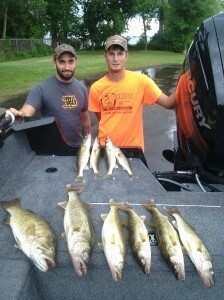 But we did well! 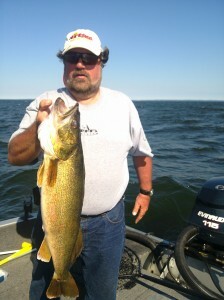 I have Thursday open next . 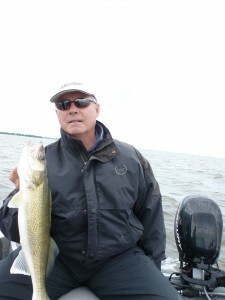 Give me a call or email me,- and lets go fishing on Winnebago!!! 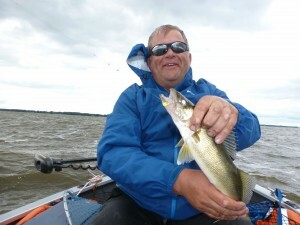 This entry was posted in Uncategorized on July 16, 2014 by Jim Kleist. 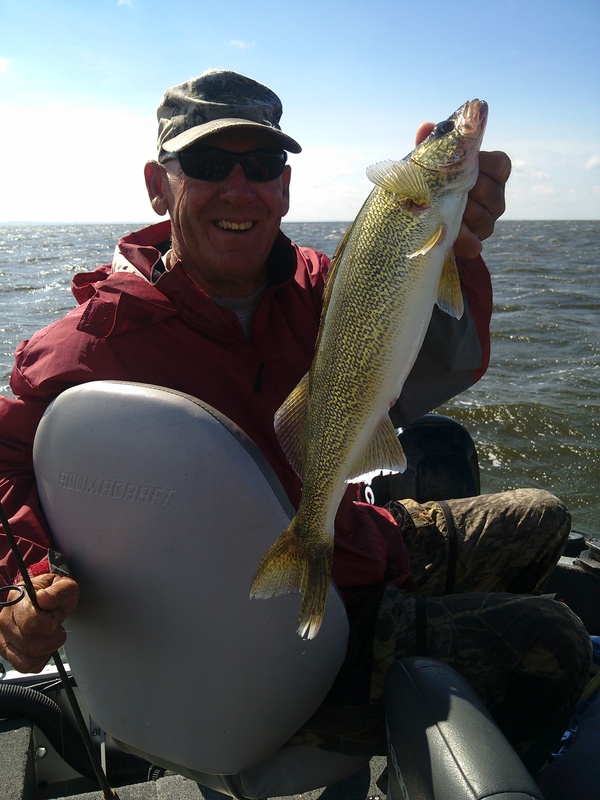 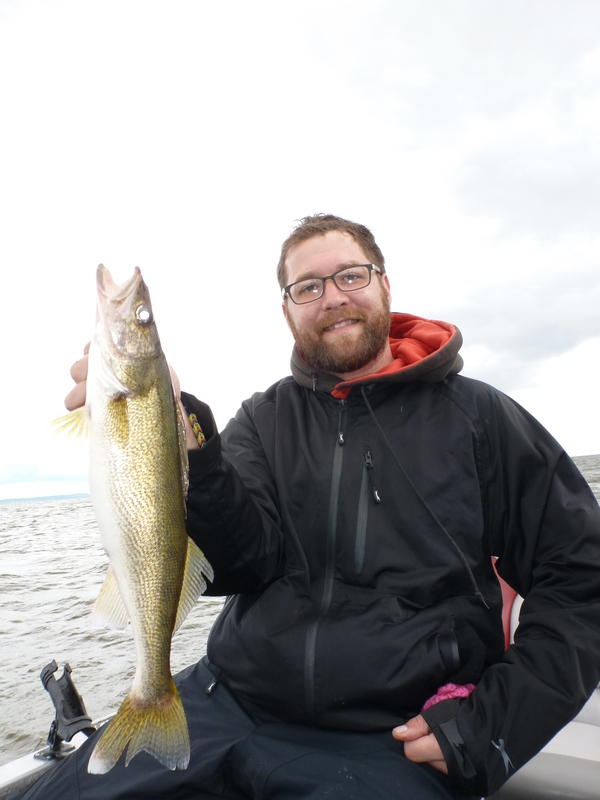 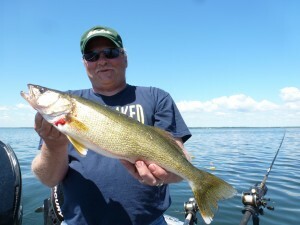 Sunday was Windy but the walleyes sure were biting great in the wind and 2 foot waves. 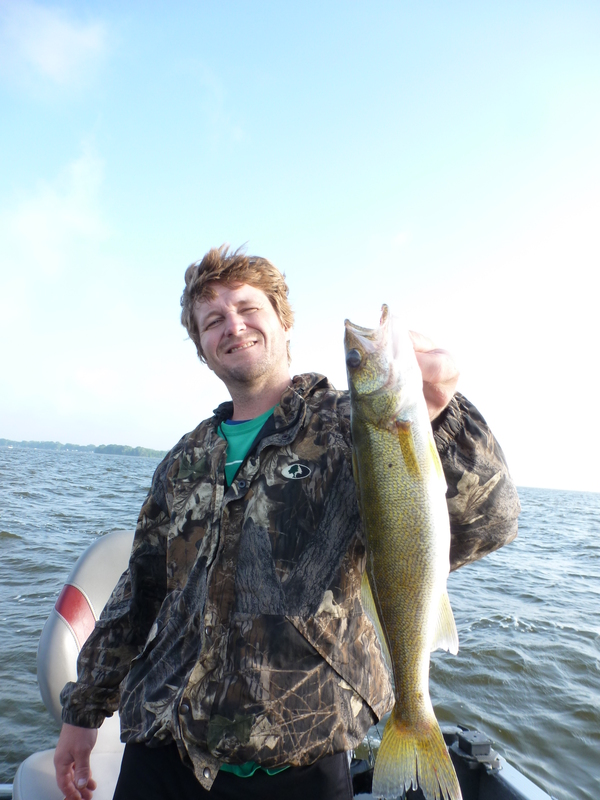 We ended up catching 20 walleyes. We kept some for dinner. 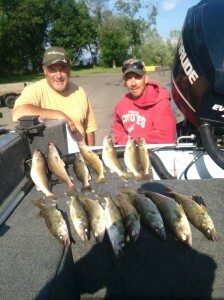 We had a ton of fun today. 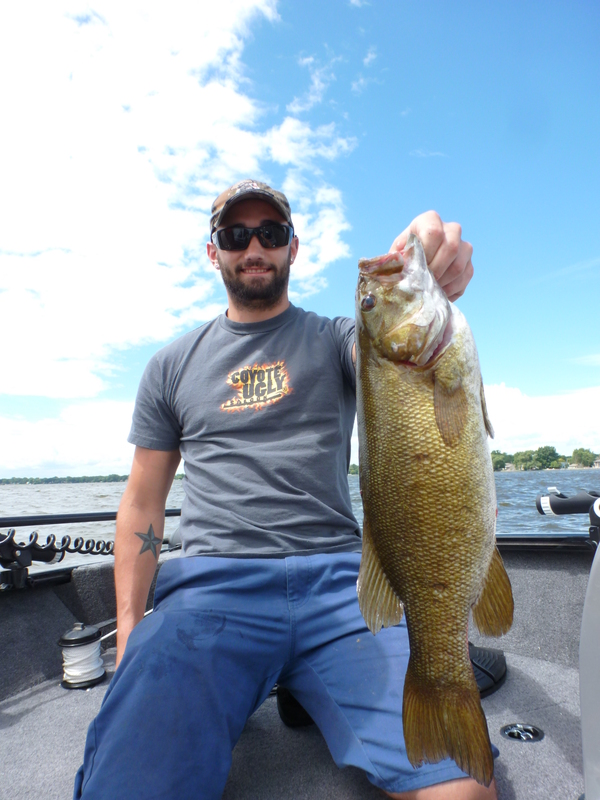 1/4oz was the best weight today. I Fished with Larry and Graham and they excellent today fishing with me. 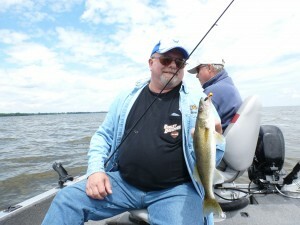 We were casting jigs, using slip bobbers and casting flicker shads. 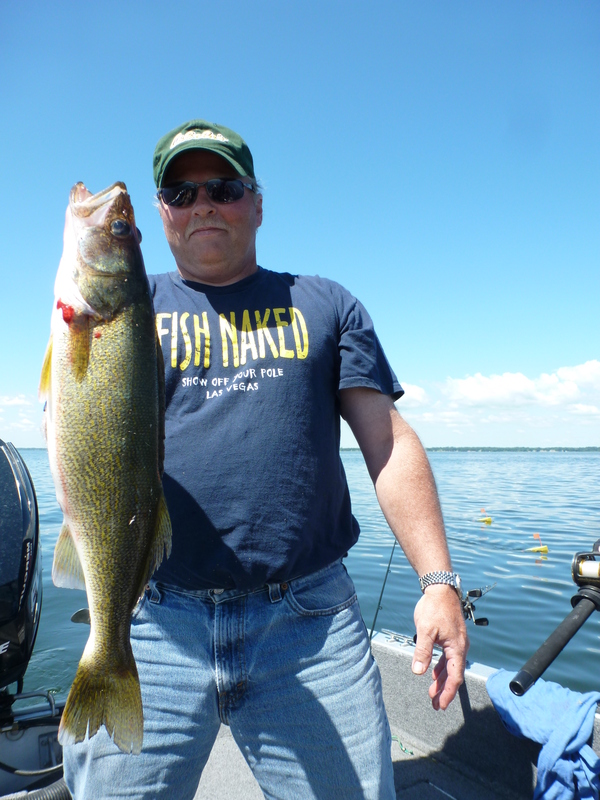 No trolling today. 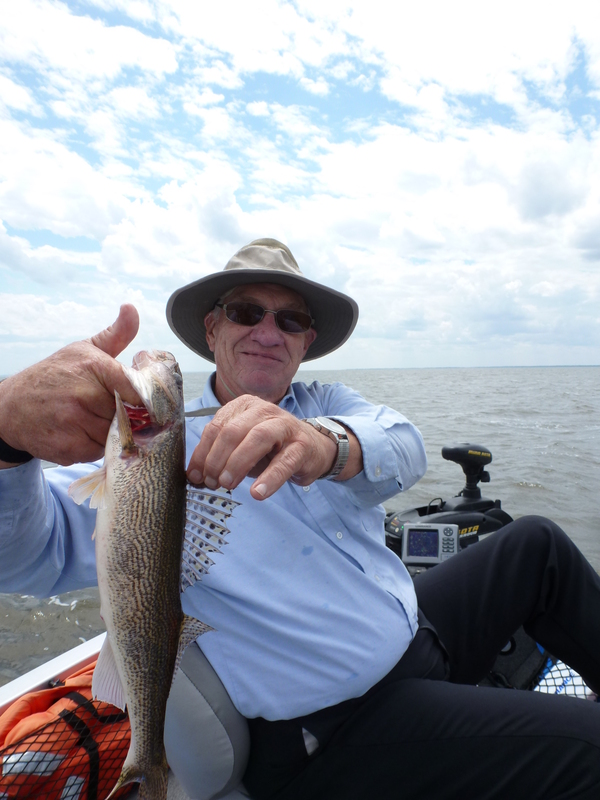 The walleye bite is still excellent and will be for a few more weeks. 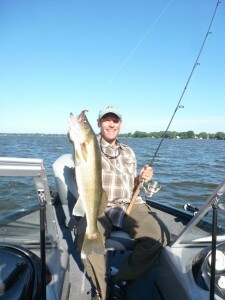 Now is the time to get out there! Good luck and enjoy walleye and Perch fishing — When the weather cooperates. 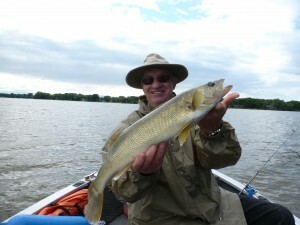 This entry was posted in Uncategorized on July 14, 2014 by Jim Kleist. 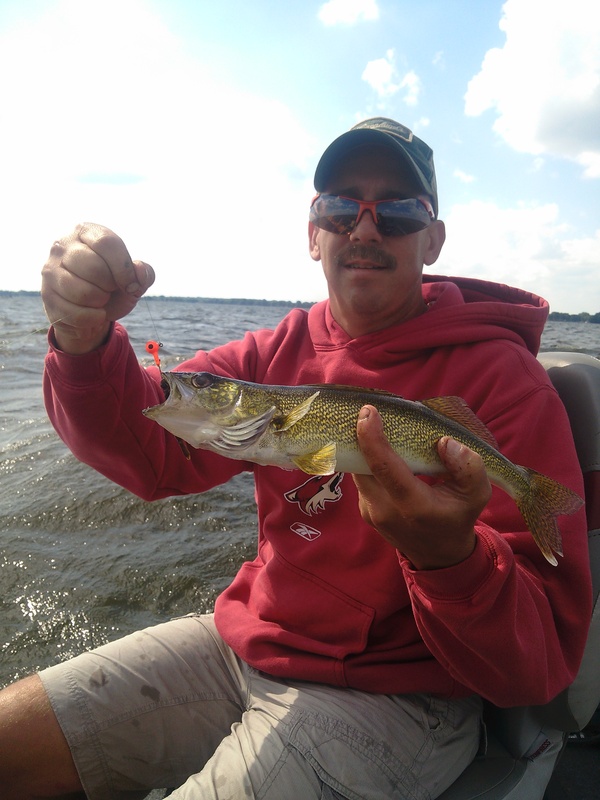 Late report for Thursday July 10th. 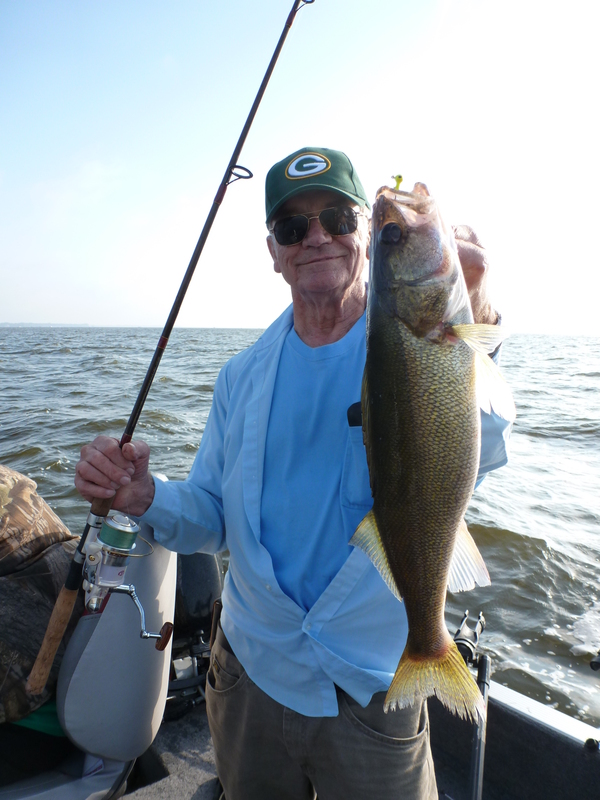 The Walleye bite is a very tough bite on Green Bay. Fish are holding in select areas. Shallow 8-10 fow and deep water out to 35′. 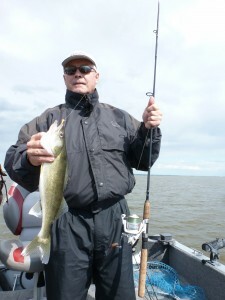 I have been using cranks in shallows and Green & Gold harnesses out deep. I fished with a gentleman Randy from who has been watching Midwest outdoors and wanting to catch a 10 # fish for the wall. We ended up doing that! 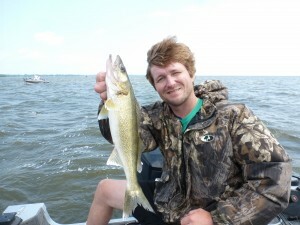 The fish is at Second Nature Taxidermy. 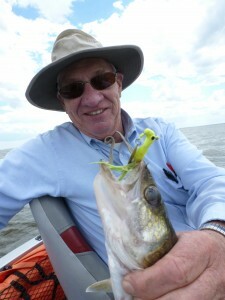 Marc Charles is a amazing taxidermist. 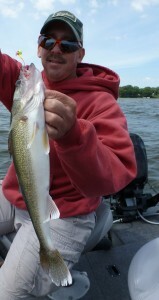 This was a dream fish for Randy his whole life! 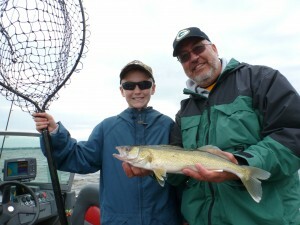 We caught 5 fish very nice Walleyes that afternoon. 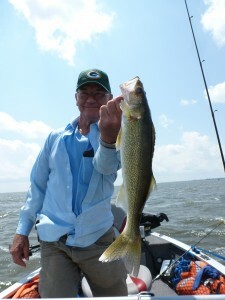 Big fish in July is a pattern on Green Bay that I really like to target. 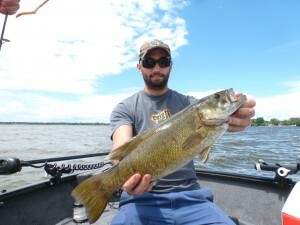 Walleye fishing on Lake Winnebago is still very good if you know how to fish the conditions. 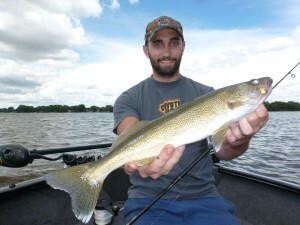 We landed over 25 walleyes. 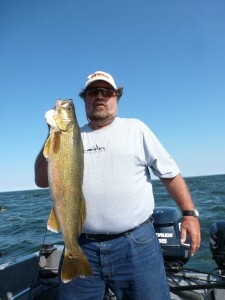 Today had 4 foot waves which creates difficulties. 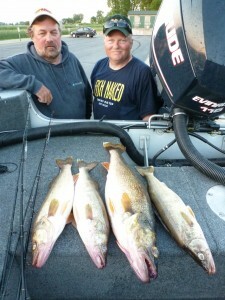 But also create opportunities if you and your boat and your fishing partners are up to the challenge. 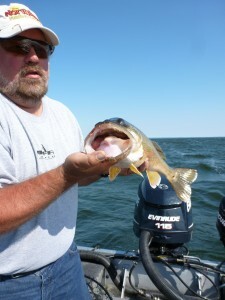 Drift socks, good electronics and changing up equipment and experimenting with equipment, locations and switching baits. We did Zero trolling and had so much fun! We ended up landing over 25 Walleyes today and kept some for dinner. 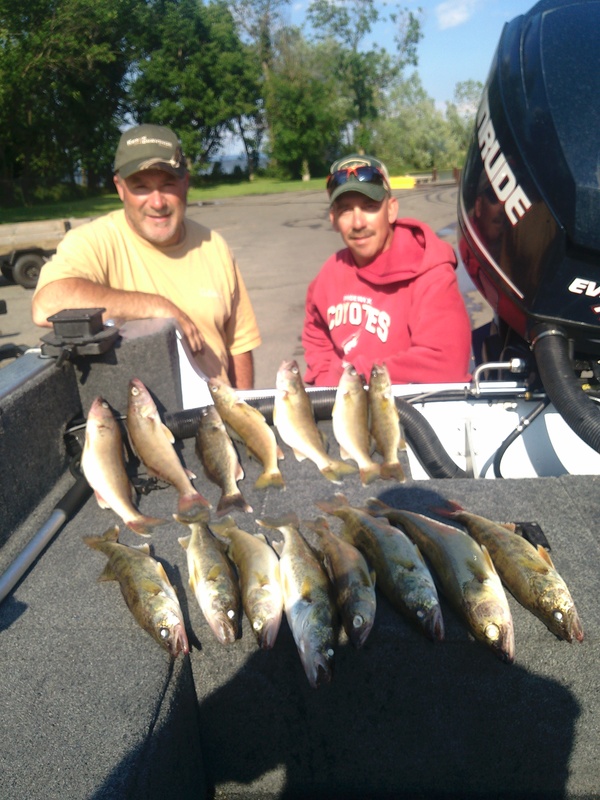 Scott and Pete did excellent with St Croix and Fenwick, jigging, anchoring, casting crank baits and using slip bobbers and Lindy rigs. If you are looking to add a new skill set and do well book a all day trip with me on Lake Winnebago. 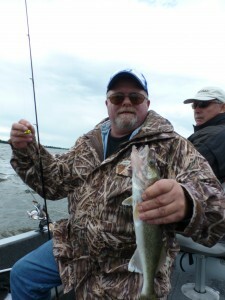 I do all jig trips like today or combo trips trolling and jigging. 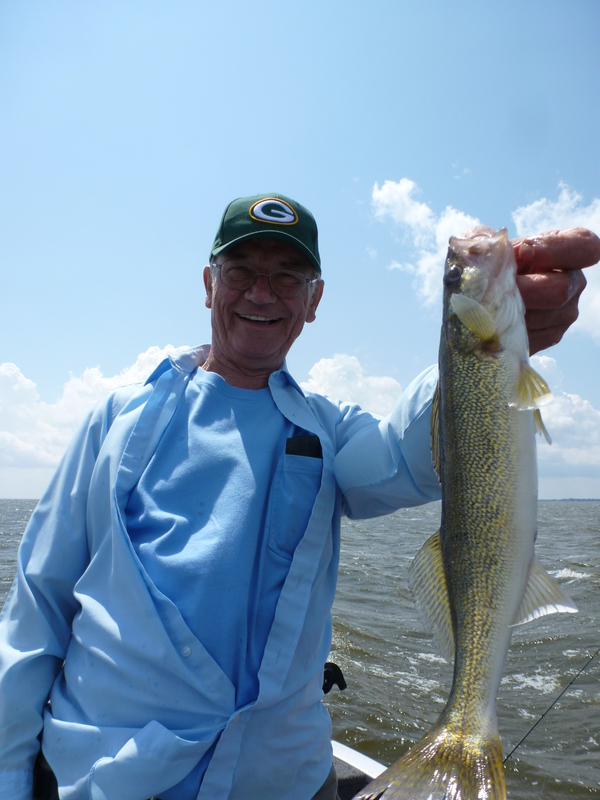 This entry was posted in Uncategorized on July 6, 2014 by Jim Kleist.